The life of the great French painter, one of the founders of Impressionism, is narrated in lush comic art reminiscent of his style. From the Salon des Refuses ("Salon of the Rejected") and many struggling years without recognition, money, and yet a family to raise, all the way to great success, critically and financially, Monet pursued insistently one vision: catching the light in painting, refusing to compromise on this ethereal pursuit. It cost him dearly but he was a beacon for his contemporaries. We discover in this comics biography how he came to this vision as well as his turbulent life pursuing it. Salva Rubio is a Spanish writer specialized in history. With a master's degree in scriptwriting, he has been involved in many documentaries, short and feature length films. 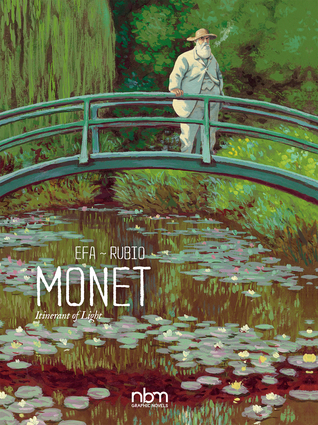 Monet is his first full length graphic novel project. EFA is a pen name for Ricard Fernandez, a Spanish artist who left school at 16 to pursue his dream of being in comics. He has since published quite a few graphic novels and series. This is his first translated into English.